They said it couldn’t happen, and it did. The Chicago Cubs won the World Series. Then just six days later, something else that couldn’t happen happened; Trump was elected President. Based on that, since Utah is the Bee Hive state, why couldn’t Naperville become the bee hive capital of the world. Somebody has to do it, so why not Naperville? This probably wouldn’t even be a thought, if it wasn’t for the Naperville city council making an issue of something that hadn’t been an issue in Naperville for over 185 years of existence. You ask, ‘how did this become an issue’? The answer is simple. 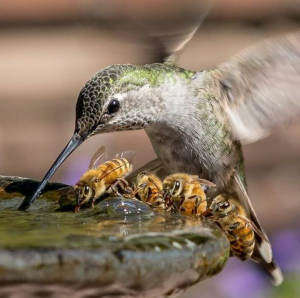 One resident, that’s one as in one, complained to a city council member that bees were making it difficult for birds to get water from her bird bath. Oh, what a great city we live in, when that is considered an issue to be regulated. The council member, who’s name rhymes with ‘Anderson’ rather than dealing with the ‘issue’ one on one with the resident and putting the ‘issue’ to rest, decided to stoke the flame of discontent, and bring the ‘pressing issue’ to the council for lengthy bantering between council members, leading to the type of action that council members live for, which is regulating something that was never regulated in 185 years. They decided to limit the number of hives on a normal size lot to three, and issuing a few more restrictions including the distance a hive must be from the lot line, and the height of the fence needed to contain the bees. Bees aren’t dumb, they are still going to cross over a lot line, fly above a fence, and enjoy water from a bird bath along with the birds. The birds and the bees have been a topic of discussion for years with no problem. The council’s action, along with more and more people becoming aware of the plight against bees, has stirred interest among residents to try their hand at beekeeping. Now here is where it gets exciting. Let your mind just think of the possibilities. The average bee hive has 25,000 bees. With a maximum of 3 hives per lot, that’s 75,000 bees per lot. Let’s conservatively say there are 13,000 lots in Naperville. If everybody became involved in beekeeping, minus the resident who complained, that’s one billion bees. Think of the amount of honey Naperville could produce. Think of the number of blooming flowers we could have. Which would, of course, then give the city council an opportunity to regulate the number of flowers a resident can have in their yard. Council members would be ecstatic. Now I know this is a stretch, but just imagine if bees could be trained to fly late at night, like homing pigeons. Imagine 1 billion bees being dispatched to downtown Naperville at 1am to clear out a crowd of over-served, trouble-makers. Bingo, another problem solved. Don’t say it can’t happen. Science just hasn’t figured out a way to make it happen. Still don’t think it’s possible. Spring training starts in just a few weeks for the World Champion Cubs, and President Trump is staying up late and getting up early to Make America Great Again. As ridiculous as this is, can someone report on the merging of other towns to link with Naperville ?? Could other towns be coerced to pay our outrageous debt in electricity being purposeful of the merger ?? Thank you. J.